Come experience the new Galaxy S9. 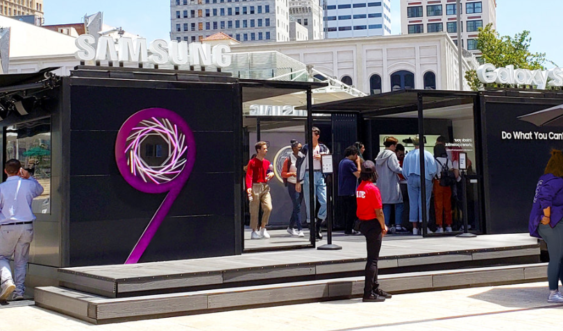 Samsung is heading out on a national tour to celebrate the launch of the Galaxy S9 | S9+, bringing the latest innovations in Samsung technology straight to you. Experience what it’s like to radically slow down time in its Super Slow-mo pod to creating a life-like version of yourself with Augmented Reality showing you the unprecedented power of the Galaxy S9 | S9+. Your local Galaxy Studio is bringing some of the favorite Galaxy S9 | S9+ features to life. At the studio, visitors will be able to get a hands-on experience through customized pods that demonstrate cutting-edge technology and entertainment. In addition to showing off the latest Galaxy S9 features, they will also bringing you an array of experiences and events to inspire, educate and entertain.